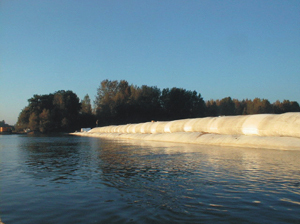 Creation of artificial banks with the STABIPLAGE® The STABIPLAGE® can be used as a core in the construction of dune or artificial banks. This configuration gives an aesthetic solution and makes safe urban or cultivated areas, liable to flooding. This solution which preserves the attraction of the site, guarantees a stable and safe core, ultimate rampart against the flood, even in case of important immersion which would involve the removal of loose materials or embankments. With the objective of a covering and a vegetable stabilization, the permeability of theworks and the roughness of the cover enable the vegetation to take rootand ensure the requested drainage for the soil's life.